Today is exactly 60 days until midterms. 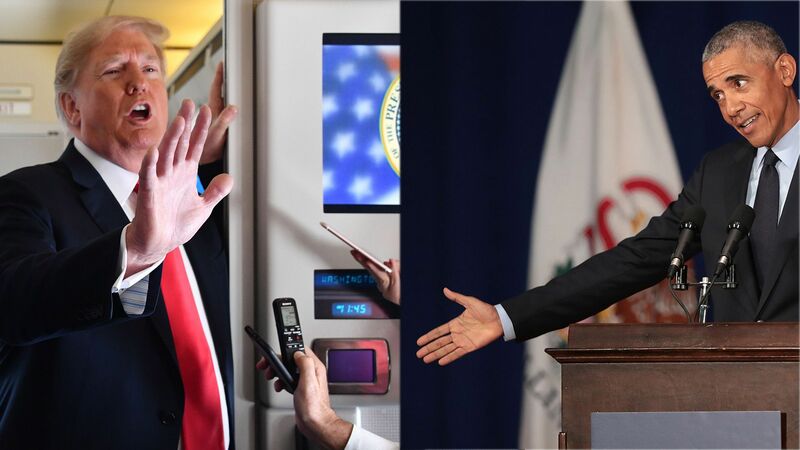 Yesterday's personal, venomous face-off between President Obama (who went after his successor by name in Illinois) and President Trump (who attacked Bob Woodward and threatened the New York Times aboard Air Force One) said it all about the coming fall. The state of play: Republican lawmakers would love to talk about the growing economy. House Democrats have a high-minded closing argument, "For the People." "[I]n the end, the threat to our democracy doesn't just come from Donald Trump or the current batch of Republicans in Congress or the Koch Brothers and their lobbyists, or too much compromise from Democrats, or Russian hacking. The biggest threat to our democracy is indifference." "The biggest threat to our democracy is cynicism." "'I'm sorry — I watched it, but I fell asleep. [Laughter] I found he's very good — very good for sleeping." "He was trying to take credit for this incredible thing that's happening to our country." A little story: On Wednesday afternoon, Republican congressional leaders met with Trump in the Roosevelt Room. They were cranky and complaining — the House leaders know they're likely to be in the minority come January, helped along by his tariffs and unpopularity. POTUS shared their mood: This was Woodward-anonymous week. But then White House economic adviser Larry Kudlow whipped out a chart and showed it to Trump. It was the just-published August edition of a manufacturing index from the Institute for Supply Management, pointing to "the highest expansion in factory activity since May of 2004," per Trading Economics. The president loves charts, and so do members of Congress. He was happier. The mood brightened, and the meeting ended on a better note. But what are the chances of that translating to the campaign trail? Zero-ish. Be smart: Despite relative prosperity in the nation and peace in the world, both sides expect a slash-and-burn fall — focused on what they see as the evil intent of the other side, and aimed at inflaming their own voters.